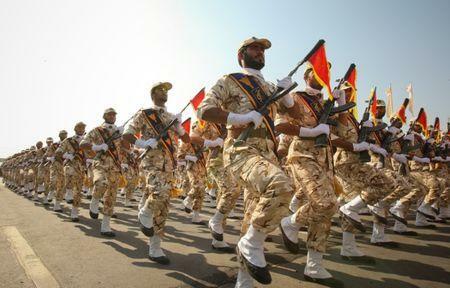 DUBAI (Reuters) - Iran's elite Revolutionary Guards vowed on Sunday to exact "deadly and unforgettable" vengeance for an attack on a military parade that killed 25 people, including 12 of their comrades, and Tehran accused Gulf Arab states of backing the gunmen. Saturday's assault, one of the worst ever against the most powerful force of the Islamic Republic, struck a blow at its security establishment at a time when the United States and its Gulf allies are working to isolate Tehran. "Considering (the Guards') full knowledge about the centres of deployment of the criminal terrorists' leaders ..., they will face a deadly and unforgettable vengeance in the near future," the Guards said in a statement carried by state media. 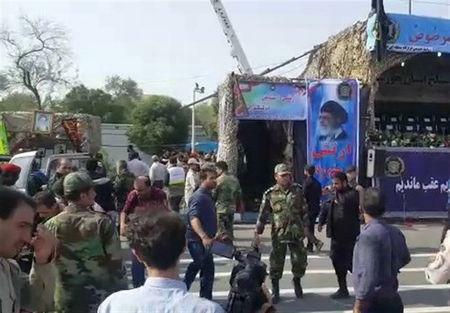 Four assailants fired on a viewing stand in the southwestern city of Ahvaz where Iranian officials had gathered to watch an annual event marking the start of the Islamic Republic's 1980-88 war with Iraq. Soldiers crawled about as gunfire crackled. Women and children fled for their lives. Islamic State's Amaq agency posted a video of three men in a vehicle who it said were on their way to carry out the attack. A man wearing a baseball cap emblazoned with what appears to be a Revolutionary Guard logo discussed the impending attack in Farsi in the video. "We are Muslims, they are kafirs (non-believers)," the man says. He adds: "We will destroy them with a strong and guerrilla-style attack, inshallah (God willing)." Ahvaz National Resistance, an Iranian ethnic Arab opposition movement which seeks a separate state in oil-rich Khuzestan province, also claimed responsibility for the attack. Neither of them provided evidence. There has been a blizzard of furious statements from top Iranian officials, including President Hassan Rouhani, accusing Iran's adversaries the United States and Gulf states of provoking the bloodshed and threatening a tough response. Nikki Haley, U.S. ambassador to the United Nations, rejected Rouhani's accusations. "He's got the Iranian people ... protesting, every ounce of money that goes into Iran goes into his military, he has oppressed his people for a long time and he needs to look at his own base to figure out where that's coming from," she told CNN. 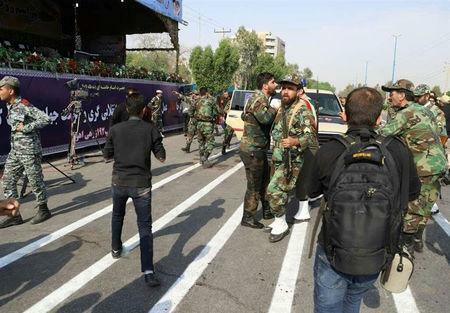 Senior commanders of the Islamic Revolutionary Guards Corps (IRGC) have said the Ahvaz attack was carried out by militants trained by Gulf states and Israel, and backed by America. But it is unlikely the IRGC will strike any of these foes directly. The Guards could put on a show of strength by firing missiles at opposition groups operating in Iraq or Syria that may be linked to the militants who staged the attack. They are also likely to enforce a tight security policy in Khuzestan province, arresting any perceived domestic opponents including civil rights activists. Three Arab activists told Reuters that security forces, especially the intelligence branch of the Revolutionary Guards, had detained more activists in Ahvaz. Rouhani engineered Iran's 2015 nuclear deal with world powers that ushered in a cautious detente with Washington before tensions flared anew with President Donald Trump's decision in May to pull out of the accord and reimpose sanctions on Tehran. The attack on the military parade is likely to give security hardliners like the Guards more political ammunition because they did not endorse the pragmatist Rouhani's pursuit of the nuclear deal with the West, analysts say. In New York, Trump's personal lawyer Rudy Giuliani said on Saturday that U.S. sanctions were inflicting economic pain on Iran that could lead to a "successful revolution". The Trump administration has said that changing Iran's system of government is not U.S. policy. U.S. Secretary of State Mike Pompeo told Fox News on Sunday that Trump was willing to meet top Iranian officials for talks. Asked if Trump would like to meet with Supreme Leader Ayatollah Ali Khamenei, the highest authority in Iran, Pompeo replied: "The president has said he'll talk with anyone if we can have a constructive conversation." Mostly Shi'ite Muslim Iran is at odds with Western-allied Sunni Muslim Saudi Arabia for predominance in the Middle East. The regional superpowers support opposing sides in the civil wars in Yemen and Syria, as well as rival political groups in Iraq and Lebanon. A senior United Arab Emirates official denied Iranian allegations alluding to the involvement of the UAE in training gunmen that claimed the attack. The "formal incitement against the UAE from within Iran is unfortunate, and has escalated after the Ahvaz attack," Minister of State for Foreign Affairs for the United Arab Emirates Anwar Gargash said in a tweet.